The fracking process. Picture source: Wikimedia Commons. Yes, today I am going to talk about the hottest current event. The great fracking debate. This controversial mining technique has been linked to pollution, groundwater contamination, radioactive pollution, and earthquakes. Only yesterday New Zealand’s Energy and Resources Minister, Phil Heatley declared he had “no concerns” about the use of fracking in New Zealand, despite the process currently being investigated by the Commissioner for the Environment. Heatley told TV ONE’s Q+A program that expanding oil and gas exploration (using fracking) could pay for schools hospitals, and extended paid parental leave in NZ. Click here for the full interview transcript. Furthermore, last week Christchurch City Council, became the latest council in NZ to declare their area a ‘Fracking Free Zone’. The Clean Country Coalition lists other NZ Local Authorities positions/decisions on their webpage. I’m going to put aside the obvious environmental debate about oil and gas drilling in the seas around New Zealand, and explore the controversial issue of fracking. So what is it anyhow? Fracking, aka Hydraulic Fracturing is done to increase the rate of extraction in natural oil and gas reservoirs, by creating conductive fissures through the rock for oil and gas to flow. This is done by pumping fluids (most often water and chemical additives) into deep geological formations, hundreds of meters below ground. The pressure of the fluids exceeds the strength of the rocks, and creates or enlarges large cracks throughout the formation. A proppant agent, such as sand or ceramic is then pumped onto the cracks to keep them from closing when pressure is released. How does this affect our water? 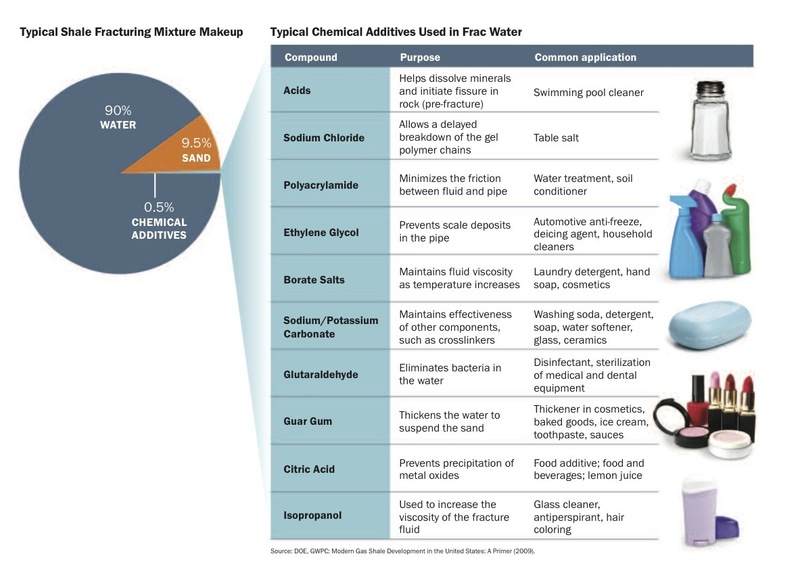 Fracking fluid typically contains water, proppants, and chemical additives. 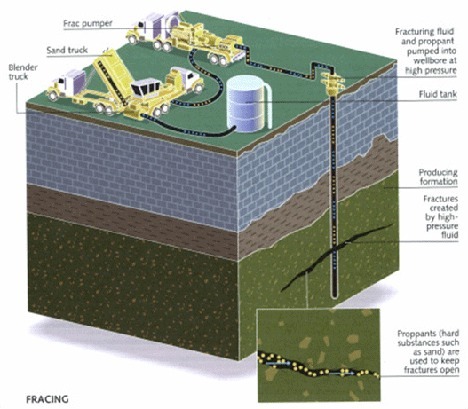 If not removed properly, the deep ground pressure forces the fracking fluids to rise to the surface along with any contaminants that it contains. In some cases they may end up in a groundwater aquifer. Chimicals commonly used in the fracking fluid. Picture source: American Petroleum Institute. Its not very nice to think of any of these things coming out of our taps. However, my next blog will present a case study of a community in the USA who did find harmful contaminants in their water due to poor fracking techniques at a nearby oil field. Until then, here’s a little light relief for you all.